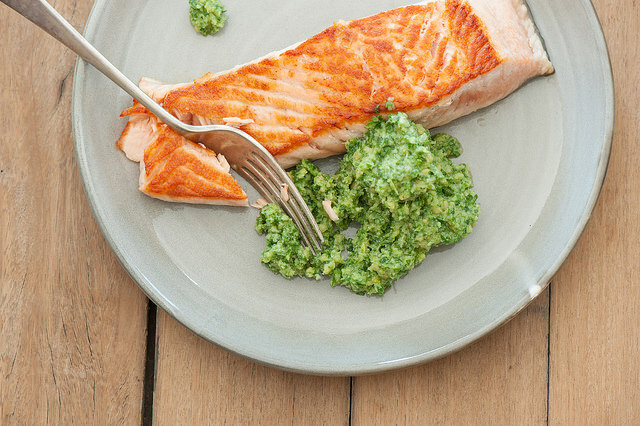 This pesto is a delicious way to use up all the inner leaves and stalks in a head of celery. Try it, I promise you’ll be pleasantly surprised. Drizzle extra-virgin olive oil in slow stream just until mixture holds together. Sandwich spread in place of mayo. Milder sandwich spread: mix pesto and mayo. Spoon over fish, chicken, steak, pork, or turkey. Salad Dressing: mix pesto and mayo, add a little fresh lemon juice, thin with buttermilk. Taste and add sea salt and/or black pepper to taste. Pasta Sauce: mix pesto and extra-virgin olive oil. Taste and add sea salt and/or black pepper to taste. Garden Fresh Tomato Soup: mix a little pesto into Tomato Soup.